4MOST is currently in its Manufacturing Phase with an expected start of science operations in 2022. The ESO community will be able to express their interest to use the 4MOST Facility for Public Surveys through a Call for Letters of Intent expected to be released in the summer of 2019. To prepare the community for this opportunity ESO and the 4MOST Consortium have published a 4MOST issue of The Messenger and are organising a workshop in Garching on 6-8 May 2019. 4MOST enables many science goals, but our design is especially intended to complement a number of key large-area, space­-based observatories of prime European interest: Gaia, eROSITA, Euclid, and PLATO, and future ground-based, wide-area survey facilities like LSST and SKA. 4MOST will unfold maximum impact by operating continuously for an initial five-year Public Survey programme delivering spectra for ≥25 million objects over ≥15 000 square degrees. Read more about 4MOST science and the survey programme. 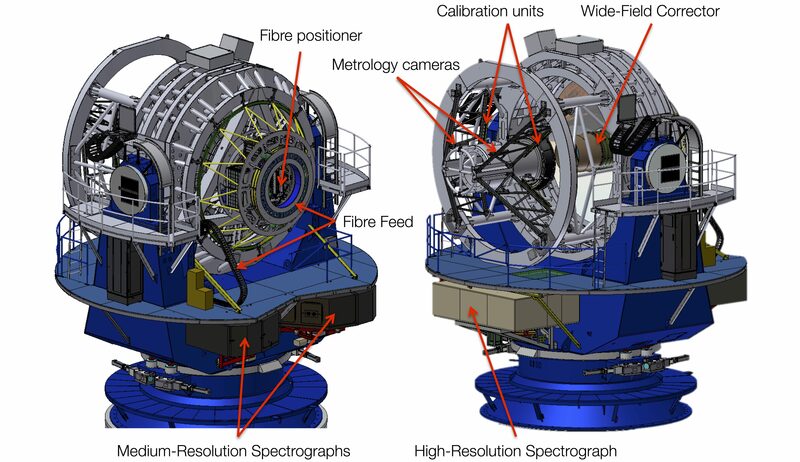 The 4MOST Facility comprises the instrument as well as the software to schedule and observe many surveys in parallel, and the data management system to reduce, analyse, validate and publish all data, including higher-level data products (radial velocities/redshifts, stellar parameters, abundances, etc.). Find out more about the facility. The 4MOST Consortium consists of 15 institutes in Germany, Australia, France, the Netherlands, Sweden, Switzerland, and the UK, under leadership of the Leibniz-Institut für Astrophysik Potsdam (AIP). See all consortium partners and their roles.